When You Shop and Dine in Irvine, Your Dollars Stay in Irvine. For every $100 in taxable sales in Irvine, one dollar goes directly to the City, supporting public safety, parks, streets and much more. Every time you shop and dine in Irvine, you help preserve the outstanding quality of life here. Total General Fund resources for fiscal year (FY) 2018-19 is anticipated to be $199.8 million, an increase of $7.4 million, or 3.9 percent, from the previous fiscal year. 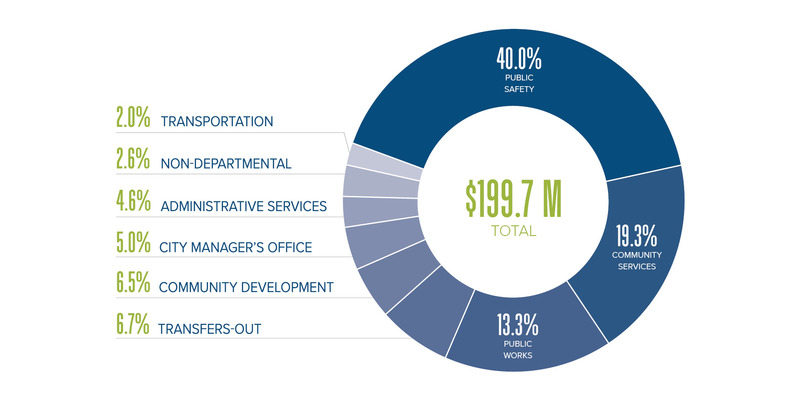 The City's FY 2018-19 total General Fund budgeted expenditures are $199.7 million, an increase of $3.6 million, or 1.9 percent, from the previous fiscal year. Although Irvine’s population has grown more than 30 percent in the past 10 years, adding pressure on service demands and infrastructure, the costs per resident have remained relatively flat over the same time period, due to Irvine’s dedication to strong fiscal accountability. As Irvine’s largest revenue generator, property tax is collected by the County and allocated according to state law among cities, counties, school districts, and special districts. The Capital Improvement Program (CIP) identifies major public improvements to the City's infrastructure, and is used to plan and manage the City's growth. Why Choosing Irvine First Matters! Among the Safest - Irvine is one the safest cities in America, with the lowest rate of violent crime per capita of any city in the nation with a population of 250,000 or more. Through the City Council’s leadership, Irvine continually focuses resources on maintaining a safe environment for residents, businesses, and visitors. The City’s strategies are based on the assumption that prevention is one of the most important and, in the long run, most cost-effective means of sustaining a safe and secure community. Employment - Businesses in Irvine create local employment and self-employment opportunities. Return Investment to Schools and Charities - Local businesses are proportionally more generous in their support of local charities, schools, and community events. Therefore, supporting local shops means a financial contribution to your community. Strong Economic Base - Businesses tend to spend locally for inventory and supplies, extending the benefit of that initial local dollar spent in Irvine. Environmental Sustainability - Local businesses often stock a high percentage of locally sourced goods that do not require long-distance transportation, helping to reduce our global footprint. Better Customer Service - Surveys show people receive better customer care and service locally. These businesses survive by their reputation and repeat business, which means you get a higher standard of service. Irvine is uniquely qualified for businesses and families. Hear from some local businesses why Irvine is for you in this video produced by the Greater Irvine Chamber of Commerce.